Since the Hawaiian people first inhabited Kawaihae on the Kohala Coast of the Big Island, the reefs fronting Pua Ka`ilima Cultural Surf Park have been used for surfing. 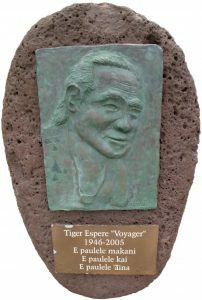 In 1992, Tiger Espere started a tradition bringing together surfers not only from the Big Island but from many parts of the world to compete in the Tiger Long Board Classic at Kawaihae. This planted the seed for the beginning of Pua Ka`ilima and today, nearly 17 years later, the seed has grown into a beautiful shoreline park which provides facilities and access to Pua Ka`ilima’s extraordinary waters and reefs. Whether you are a swimmer, diver, fisherman, sailor or surfer Pua Ka`ilima offers a unique opportunity to enjoy these activities. The Surf Park has been made possible solely through public funding and volunteer workers. We need your support to maintain and operate this beautiful park. Please take the time to donate whatever you can spare. It is for all of us and the future generations to come.